The name Guttera is a combination of the Latin words gutta, meaning "spot" and -fera, meaning "bearing" (from ferre: to bear). The two species are found in forests of sub-Saharan Africa. 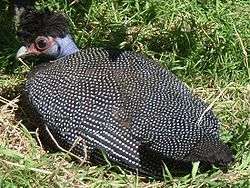 Unlike other guineafowl, they have a distinctive black crest. ↑ "ITIS Report: Guttera". Integrated Taxonomic Information System. Retrieved 23 November 2014. ↑ Jobling, James A. (2010). The Helm Dictionary of Scientific Names. London, UK: Christopher Helm. p. 182. ISBN 978-1-4081-2501-4. This article is issued from Wikipedia - version of the 3/25/2015. The text is available under the Creative Commons Attribution/Share Alike but additional terms may apply for the media files.